The Woolsey Fire, which started near Simi Valley and spread to Malibu, parts of the San Fernando Valley and Ventura County, burned 98,362 acres and caused three firefighter injuries and three civilian deaths, according to a report from the California Department of Forestry and Fire Protection. As the fire, now 100 percent contained, blazed through Southern California, the Eagle Rock community proved its eagerness to help the Los Angeles Fire Department (LAFD). At 1:05 p.m. Nov. 11, Mariajose Garcia-London posted to Facebook a call for fellow Eagle Rock Community Facebook Neighborhood Group members to bring donations to Fire Station 42, which is located on Colorado Boulevard just east of Eagle Rock Boulevard. “Dear eagle rockers. My husband and daughter just dropped off water supplies to the fire station on Colorado. The firefighters were up in Malibu all last night and are Resting up for their next shift. They said they are low on water so if you can swing by and give them more water and thank them for all the hard work they do, would be really appreciated!” Garcia-London said via Facebook. Multiple members of the Facebook group responded with further questions about how to drop off supplies. At 3:56 p.m. Nov. 11, the LAFD released a statement saying that they were grateful for the support but were becoming overwhelmed by the donations and having logistical issues storing supplies. “Sadly, we’re not only emotionally overwhelmed with your profound kindness during the Woolsey Fire, but logistically as well. To the point that the well-meaning donation of physical goods to firefighters is at the brink of causing harm,” LAFD said via Facebook. 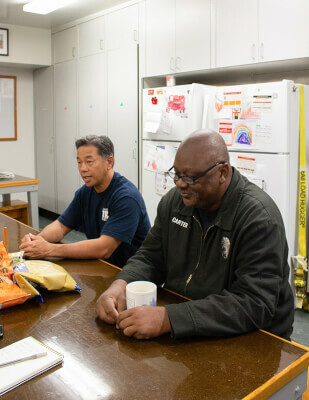 Lafayette Carter, captain of Station 42, said that while the fire department is interconnected between the stations with communication and movement of firefighters, there is no set program to allocate resources to the stations that need them most urgently. “We don’t have any logistical transportation or anything or somebody going around and taking those type of donations and taking them out there,” Carter said. The donations are plentiful, Carter said, but firefighters have no real transportation plan to get supplies towards the fire stations closer to the Woolsey Fire. Firefighter Bennett Wong said that the number of donations varied between stations. “Other stations may get even more. Some may not get as much depending on where they’re located,” Wong said. Carter said that Fire Station 42 was very grateful for the donations and support. He recalled the exhaustion after fighting a past fire and the relief supplies brought. “It was a blessing to come to a station that had water, that had Gatorade, that had sunscreen and those different type of things that we were receiving from different people in the neighborhood,” Carter said. 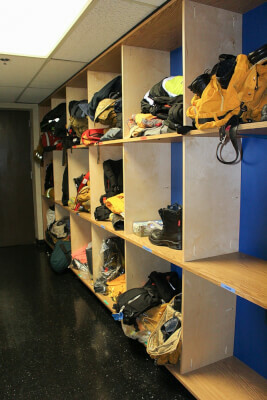 Based on their donations, community members seemed to know what items were helpful to the firefighters. “Some of the things they gave were perfect, like water drops for our eyes due to the dust that we’re dealing with, different type of foot powders for the comfort of our boots for being on them for three or four days straight, wipes. I mean everything they gave was so pertinent to what we do when we’re out there,” Carter said. However, Carter said that there can be too much of a good thing, including donations. “It became overwhelming to the point where we said, ‘Great, time out,’ ” Carter said. Garrett James Dunn, an Eagle Rock resident, dropped off two cases of water at Fire Station 42 after seeing Garcia-London’s post earlier that day. Carter and Wong say that they’ve discussed what actions to take so that extra donations do not go to waste. While Fire Station 42 and the LAFD at large received lots of donations and supplies during the Woolsey fire, according to Carter, this trend of donating supplies to fire stations began to see a large influx during the Creek Fire in Stanislaus National Forest, which burned from December 2017 to January 2018. The quick spread of information regarding what the LAFD needs and does not need is based heavily on Facebook communication. Some community members saw posts like Garcia-London’s before they saw the LAFD’s statement. “Social media is very new and it’s the Wild West, things get kind of lost,” Dunn said. Dunn says that his interaction with the firefighters at Station 42 was easy and that they were very grateful. “They patted me on the back and shook my hand and said ‘Thank you very much,’” Dunn said. Carter and Wong appreciate the deep sense of support from the Eagle Rock Community community. “We find that everyone in our community loves our station,” Carter said.